I only have two words to say about this magnificent game: Absolutely brilliant. The storyline is fantastic and the graphics are beautiful, in other words this game is perfect. Great game. Lives up to the expectations of the first one. Stealth or combat both work. Awesome plot, different ways to play it (stealth, straight out shooting, not killing anyone, killing everyone), good graphics, combination of rpg and fps, really in depth story about a huge conspiracy around the world, awesome soundtrack. 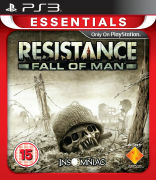 just a superb must game game for all those Deus Ex fans, RPG + FPS lovers and those who enjoy deep game play and a deep branching plot with side missions! A shooter game with cyberpunk. Its soundtrack is quite good as well. 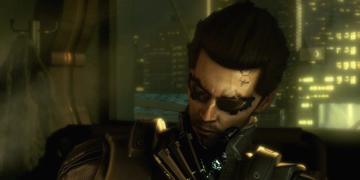 Deus Ex 3 is a good game, with a nice story and a great sci-fi setting. 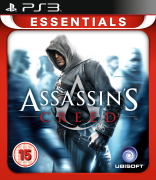 The gameplay is OK, can get repetitive after a while and the boss battles are really horrible. The game is hard, and the loading times after each death are tedious but I am enjoying it anyway as the graphics, sound and characters are great. I recommend it if you like stealth games and sci-fi. Deus Ex 3: Human Revolution is great. When I bought Deus Ex, I though that a different version of the Metal Gear Solid experience was waiting for me. Although there are some similar points, at the end I was mistaken... The game is mainly the combination of RPG and FPS elements. You have a main story with lots of side quests, experience levels, and a skill tree that you can upgrade through by gaining experience. Also, there are different types of weapons and accessories... Augmentation system is the main difference of this game from the others because you can upgrade your augmentations, and these upgrades will change your game experience. If you mainly upgrade your hiding skills, then the game will be a hide and kill experience, but if you mainly update your weapon and vitality skills, then the game will turn into an action based experience. 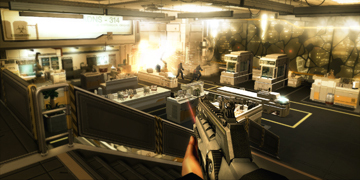 At the end, I can say that Deus Ex 3: Human Revolution is a must have for the lovers of this genre. First of all, I really love this game. I was so excited when I saw the first trailer, and now I've got it on my PS3, I have to say I'm definitely not disappointed. The controls are easy to learn, the fighting system is great and variable, and with augmentations, you can make a superhuman from your character. There is hacking mini-game which is really fun, I love the overall design of the whole environment. It's so sci-fi. The whole game has a great atmosphere, the story is interesting, and there are a lot of loveable characters. Now click the buy button. You must have this. 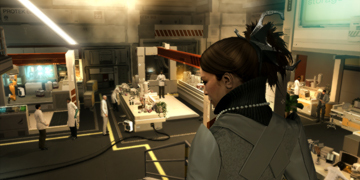 Deus Ex 3: Human Revolution is an interesting Sci-fi story with a nice soundtrack. For Sci-fi and especially Ghost in the Shell fans it's a must-have. This is a marvelous game. I absolutely recommend it. It has a very good design - graphics are all in the same colours, every character has at least 2 conversation lines, etc. It is a very good game. With this price, don't think, just buy it. This is a thrilling and very well done game! Enjoy.